Eastern Orthodoxy has been largely unknown in the West, but in the recent years there has been a surge of interest, particularly among Christians of Protestant/Evangelical orientation, many of whom wish to find out more about this mystical expression of faith that captivates by its ancient charm and connection to the early church fathers. 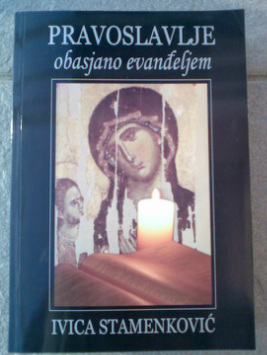 The book "Eastern Orthodoxy Illuminated by the Gospel", by Ivica Stamenkovic, will unlock the mysteries of Eastern Orthodoxy for the Western readers. It was originally published in Serbia in 2008, and thanks to the hard work of several dedicated volunteers, including the author himself, the book became available in English for the first time this year. A native of Serbia, a country with a strong Eastern Orthodox majority, Ivica had the advantage of studying Eastern Orthodoxy at its source. The product of his studies is a volume that deserves to be called nothing less than a textbook on Eastern Orthodoxy, and probably the first of its kind available in the English language. His clear, scholarly approach leaves no stones unturned. Needless to say, a study such as this one has been long overdue in the West. Even though scholarly, the book is by no means “dry”, and is an enjoyable read, cover to cover. We are happy and honored to able to present to you the book for online reading in its entirety, free of charge. Each chapter can be downloaded individually as a PDF file by following the links below. As an addition, we are including some extraordinary testimonies coming from those who were consecrated into Eastern Orthodox priesthood. These are collected in the short book "The Truth that Liberates: The Work of the Holy Spirit in the Lives of Orthodox Priests", also available as a PDF file below. Finally, for those who do not wish to delve into the studious depth of the main book, but would like a more concise summary, we provided an abridged version entitled "The Holy Scripture and the Sacred Tradition of the Eastern Orthodox Church". We hope that you will enjoy the website's contents, and be blessed by it. Click on any of the the links below and open each chapter as a .pfd document. Chapter 5: Blessed Mary or the Queen of Heaven? Chapter 20: Who are Evangelical Christians?